Christian writers such as Agrippa, in his De Occulta Philosophia Libri III (1533), or Giovanni Pico della Mirandola, and also the Roman Catholic Church, spell it "Cabala," the Latin spelling transferred over to English. Contemporary neo-hermeticists, following MacGregor Mathers (1854-1918) and Aleister Crowley (1875-1947), will use "Qabala" or some other derivitive. The word comes from the Hebrew קַבָּלָה, meaning "to receive". According to Ben-Yehudahs Hebrew-English Dictionary, in context it is a received body of knowledge, passed down orally, which serves as an exegesis of the Hebrew Scriptures, particularly the Torah or Pentateuch. A direct experience of God is central to the ideas of Kabbalah. Mackeys Encyclopedia of Freemasonry devotes almost three pages to the Kabbalah, noting "It has sometimes been used in an enlarged sense, as comprehending all the explanations, maxims, and ceremonies which have been traditionally handed down to the Jews; but in that more limited acceptation, in which it is intimately connected with the symbolic science of Freemasonry, the Cabala may be defined to be a system of philosophy which embraces certain mystical interpretations of Scripture, and metaphysical and spiritual beings." These quotes from the 19th century, and others like them, give anti-masons free rein to claim Freemasonry is cabalistic without really understanding either Freemasonry or the Kabbalah. The Kabbalah is divided into two kinds, the Practical and the Theoretical. The Practical is occupied with the construction of talismans and amulets and is of no interest to Freemasonry. The Theoretical Kabbalah is divided into the Dogmatic, which is a summary of rabbinical theosophy and philosophy, and the Literal, which teaches a mystical mode of explaining sacred things by assigning numerical values to the letters of words. The Literal Cabala  divided into Gematria, Notaricon, and Temura  was made use of in the writing of what Mackey termed the "Advanced" degrees of Freemasonry. These more properly should be termed the additional degrees of concordant masonic bodies. 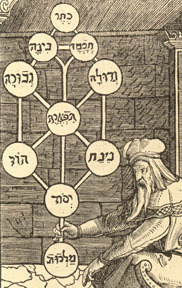 The Kabbalah plays no role in regular Craft Freemasonry. A distinctly Christian Cabala may be said to have started with the work of Ramon Lull (1232-1317) during a period of religious tolerance in Spain. Starting in the late fifteenth century CE, a movement arose among some Jewish converts to Christianity in Spain to ascribe a distinctly Christian context to the hidden meanings of Kabbalistic doctrines. This movement gained momentum from speculation among Florentine Platonists that the Kabbalah contained a lost revelation that explains the secrets of the Catholic faith. This cross-pollination led to the emergence of a distinctly Christian Cabala founded by Giovanni Pico della Mirandola (1463-1494). Pico saw in the Cabala a link to the Greek philosophers as well as a proof of the divinity of Jesus Christ. Picos writings, and subsequently those of John Reuchlin (1455-1522), created an interest that spread throughout the intellectual European community. In the sixteenth century, the appearance of Kabbalistic texts in Latin translation enhanced attempts to draw further parallels between esoteric Jewish doctrines and Christianity. Guillaume Postel translated and published the Zohar and Sefer Yetzirah into Latin even before they were published in Hebrew. Latin texts in the seventeenth and eighteenth centuries were influential in standardizing "Cabala" as the spelling commonly associated with the Christian perspective on Kabbalistic teachings. In the seventeenth century, the centre of Christian Cabala study moved to England and Germany, where its status was boosted by the theosophical writings of Jacob Boehme and the compendium of Christian Knorr von Rosenroth. Von Rosenroth and Athanasius Kirchner extrapolated the Cabalistic allusion of Adam Kadmon to be a reference to Jesus as the primordial man in Christian theology. In the final phase in the development of the Christian Cabala in the seventeenth and eighteenth centuries, it became permeated with alchemical symbolism and conjoined with the emerging doctrines of theosophy and rosicrucianism. Those who believe Freemasonrys roots are found in rosicrucian and hermetic teachings will therefore see the influence of the Kabbalah in its development. Those who claim Kabbalistic roots for Freemasonry are of two, widely different, perspectives. The first group are generally religious fundamentalists who, a priori, condemn Freemasonry, Judaism, and the Kabbalah as being anti-Christian and often equate the whole with satanism. They will also quote, out of context, from Albert Pikes Morals and Dogma: "all the Masonic associations owe to it their Secrets and their Symbols." 9 and claim that Freemasonry is divided into two branches. "There is the branch of the Scottish Rite and the branch of the Shriners. Scottish Freemasonry is the Christian branch while the Shriners are actually the Islamic branch." The Prophecy Institute in Keene Texas will, for a "donation" of $26, "inform you of what is the Cabala, and how it influences Todays governments." To anyone who has made an objective study of either Freemasonry or the Kabbalah, these accusations and claims are patently ridiculous. The second group is composed of freemasons and kabbalists who promote the theory of Freemasonrys link to the Kabbalah. They are entitled to their opinions, but it must be stressed that they do not speak for Freemasonry. They are only expressing their opinions. They view the study of both as enhancing their relationship with God and have come to some personal conclusions about what they perceive as similarities. Whatever intellectual or spiritual similarities there may be between Freemasonry and the Kabbalah, any historical links are strictly conjectural and unsupported. 1. The Practical Kabbalah guidebook, C. J. M. Hopking. New York: Sterling Publishing Co., Inc., 2001. pb. ISBN: 0-8069-3121-3. 2. Mackeys Encyclopedia of Freemasonry, vol. i. p. 166. 8. Gerald Rose, Schiller Institute Conference, September, 1993. Noted in The American Almanac, The New Federalist. 9. Morals and Dogma, Albert Pike. p. 744. Understanding the Kabbalah, Edward Albertson. The Holy Kabbalah, A.E. Waite. A Practical Guide to Qabalistic Symbolism, Gareth Knight. also see The Kabbalah Society <www.kabbalahsociety.org>.